Who can resist the fragrant embrace of plumeria? The popular Hawaiian lei blossoms are said to capture the soul and enhance the natural beauty and radiance of those they adorn. 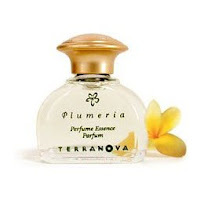 Subtle yet long lasting like a lei of blossoms, Terra Nova's Plumeria Perfume Essence is the purest form of alcohol-free fragrance you can wear.